The FreePlay Jonta is a rechargeable flashlight, powered either by a built-in crank handle, or by a wall charger. Recently when I went to test out my FreePlay Jonta flashlight, it lit up for a few seconds, and then turned off. As it had been sitting in its box awaiting occasional use, I figured the battery was dead, so I cranked the handle for a full minute, and then tried to use it again. The flashlight again lit up for a few seconds, but then immediately turned off once again. The manual that came with it indicated a full deep charge using the included power adapter for six hours or more could help bring a completely dead flashlight back to life again. After letting it charge for eight hours or so, I again tried to use the flashlight, but the extended charge appeared to make no difference, and the flashlight still refused to hold a charge. Searching online, I discovered that FreePlay no longer sells this model of rechargeable flashlight, and in fact discourages you from opening up the unit or attempting to replace the battery. FreePlay's FAQ section for this device is vague about actually performing a battery replacement, and I found no mention online of anyone else who had performed such a replacement. FreePlay's website is also strangely negative and vague about this now-discontinued device, stating "This product has been discontinued and is no longer supported. We do not carry out any repairs". This sounds strange from the same company whose products are supposed to be all about sustainability and being environmentally responsible. I also found many online reviews of this flashlight where people indicated similar symptoms -- refusing to charge after being left unused for an extended period of time. Apparently the circuitry on the unit draws a small charge from the batteries even when not in use, so it is almost mandatory to retrieve the flashlight every month or two and charge it either by cranking the handle or by using the wall adapter in order to keep the batteries topped up and healthy. 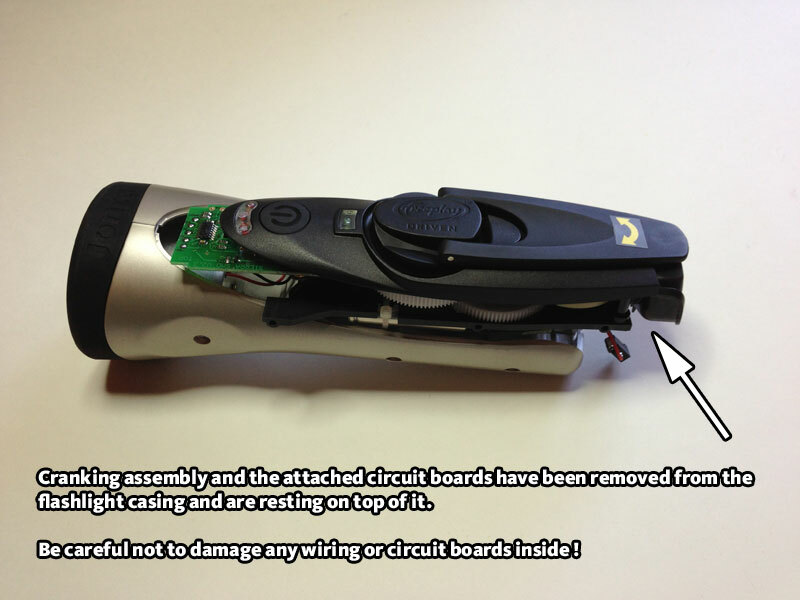 FreePlay's website strongly discourages you from disassembling this flashlight, indicating that tightly wound springs inside the units can uncoil if disassembled. Since this $70 flashlight was now destined for the recyclers if I could not successfully repair it myself, I felt no hesitation in unscrewing the unit and opening it up. The information online indicated the FreePlay Jonta's power source from the factory was a permanently installed battery pack consisting of three AA-sized rechargeable NiMH batteries, each with a 1300 mAh capacity. 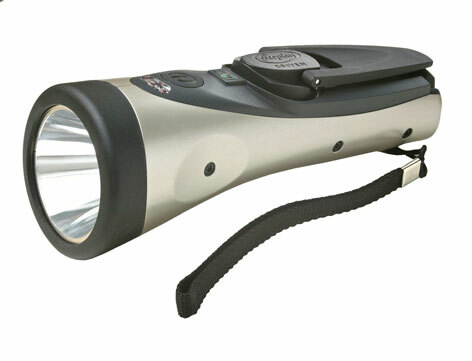 Who knows how long my original flashlight sat on a supplier's shelf after being made -- these flashlights first hit the market several years back. I went out and bought a pack of Energizer rechargeable NiMH batteries, which came with the added bonus of having a capacity of 2300mAh (almost double the original batteries' capacity). A package of four of these batteries costs around $15 plus tax, so we will have one left over after replacing the FreePlay Jonta's three old batteries. You could (and may want to) use any similar equivalent rechargeable NiMH batteries you find nearby -- an even better 2700 mAh and higher capacity is often seen in similar rechargeable AA NiMH batteries for use in digital cameras and other energy-hungry gadgets. Anything modern you put in will nearly double the original factory battery capacity of 1300 mAh, and provide longer uses of the flashlight between each recharge. Nothing too exotic listed there, mostly stuff you probably already have on your workbench or nearby. 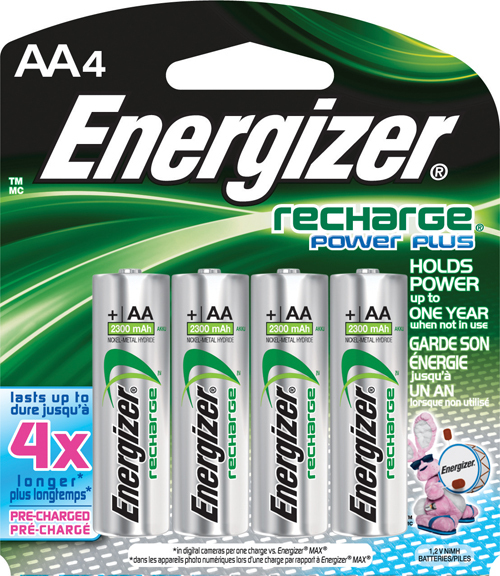 I purchased a pack of four Energizer AA rechargeable NiMH batteries (2300 mAH capacity), because they were in stock nearby, and because I have been happy with their performance in past projects. Upon removing three screws from each side of the flashlight, I was able to gently work it apart. The black cranking handle assemble was able to be gently separated out from the handle making up the flashlight's casing, taking care not to damage the small wires connecting the crank assembly to the light bulb assembly. 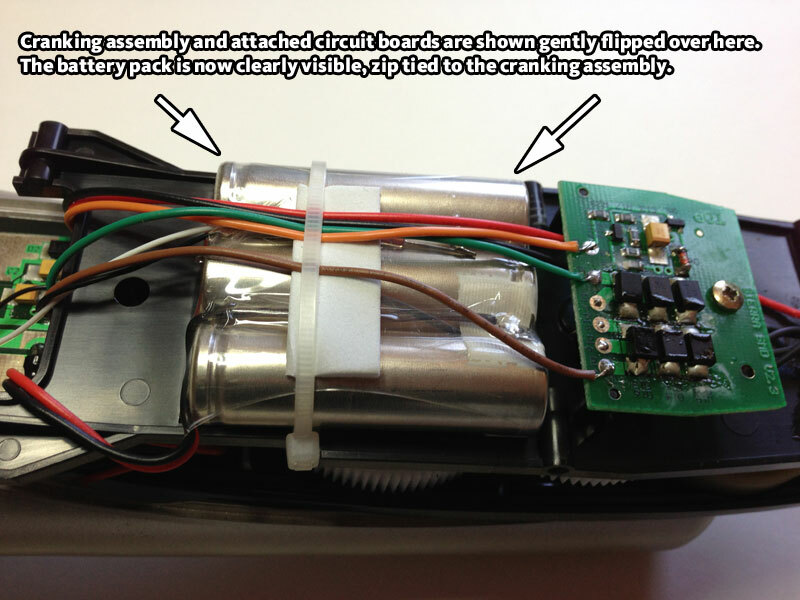 The battery pack itself was soon visible, zip-tied to the bottom of the cranking handle assembly and circuit boards. 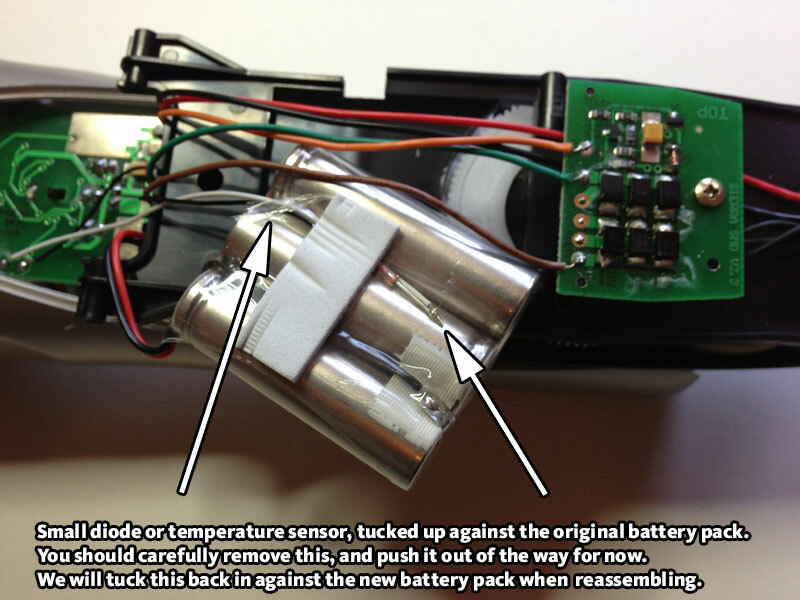 Several of the batteries in the battery pack are soldered together, and the pack itself is soldered to wires connecting to the flashlight's circuit boards. I have seen similar battery packs installed in other devices in the past. Using this type of battery pack usually guarantees that any device containing them is unusable after three or four years when the battery pack dies. After cutting away the zip-tie which held the battery pack to the cranking assembly, I was able to work the battery pack free. There is a small diode or temperature sensor tucked into the plastic covering on the existing battery pack, so carefully remove it and set it aside for now until we replace the batteries. I peeled away the clear plastic covering holding the batteries together, getting access to the wires soldered to the batteries. After unsoldering the two wires connected to the battery pack, I was able to remove it from the unit. 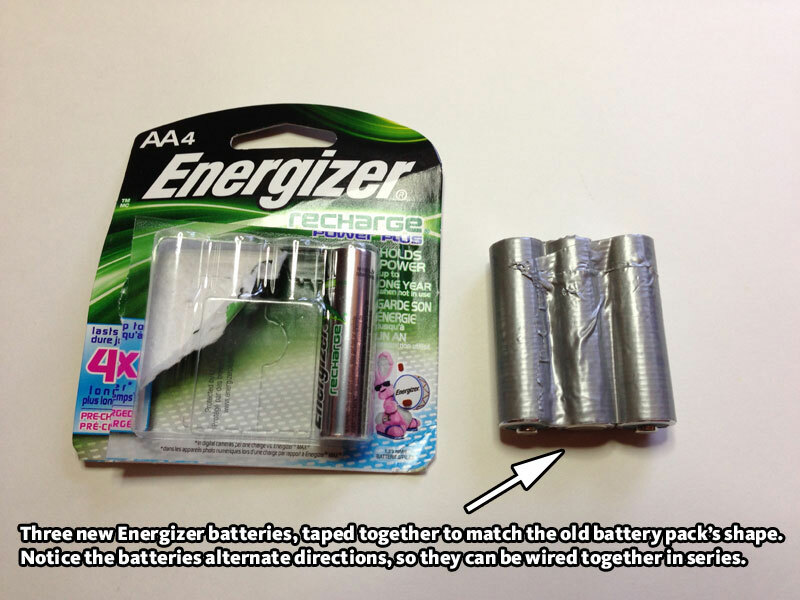 Taking three of my brand new Energizer AA rechargeable NiMH batteries, I used duct tape to shape them into a pack matching the dimensions and battery orientation of the original battery pack. I soldered two small jumper wires to connect the batteries together in series, just as the original battery pack had featured. Then, I resoldered the wires connecting the battery pack to the flashlight, and zip-tied my new makeshift battery pack to the flashlight exactly where the original battery pack had been, keeping wires and zip ties clear and away from the gears of the cranking assembly nearby. I then gently taped the small diode or temperature sensor described above so that it was resting against the new battery pack. I carefully fed the cranking assembly back into the flashlight, got everything positioned back into place, and reinstalled the three screws onto each side of the flashlight. Pressing the flashlight's power button, it immediately lit up and stayed lit, an instantly visible improvement over the old dead batteries I had removed. Pressing and holding the power button to display the current battery capacity, it showed as two LEDs out of three, indicating a healthy charged state on the rechargeable batteries straight out of the package (exactly as Energizer advertises). Turning the crank handle, it spun smoothly as normal, not catching on anything or experiencing any issues. I plugged the flashlight into the wall power adapter, and left it to charge up fully. Anyone with basic soldering experience and some patience could perform this repair. The three screws on each side of the flashlight get screwed through the flashlight casing, into the cranking assembly inside the flashlight. They screw directly into holes in the plastic of the cranking assembly, so you should be gentle when working with those six screws, and not overtighten them when reassembling the flashlight. From a design standpoint, there really was no reason why the original rechargeable batteries could not have been accessible by a hatch or door. I have removed and replaced rechargeable NiMH batteries in cordless phones and other devices after they would no longer hold a charge, easily accessible from a hatch on the underside of those devices. Moving forward, I will be adding a note in my calendar to crank or charge the flashlight monthly, in order to better remind myself how important it is to keep the battery pack topped up on a continual basis.